After 19 years of society reporting (just when I thought I knew virtually every charity in the Valley) I discovered a new one last week that blew me away. As a fourth generation patient of ovarian cancer (I broke the early-death cycle!) I can’t stop thinking about it. The charity is the Israel Cancer Research Fund (ICRF). Please remember it. It is unlike any other research — or charity — group I have ever encountered and the speaker who introduced it is unlike any other cancer survivor I’ve ever met. Here are some of the things I learned in an information-packed two-hour luncheon held in a private dining room upstairs at Lulu’s California Bistro in downtown Palm Springs. » The ICRF has been around since 1975. It currently has three branches in the U.S. (New York, Los Angeles, and Chicago), two in Canada(Montreal and Toronto), and one in Jerusalem. » Because of lower costs in Israel, every $1 you donate buys research that would cost $5 in a US research facility. And their results are proven. » ICRF research has already produced the drug Gleevec, which has saved the lives of thousands of leukemia patients without the torture of chemotherapy or radiation. » ICRF research is in hot pursuit of a similar drug for breast and ovarian cancer, and making great strides against malignant melanoma, pancreatic and lung cancer. » Israel has the world’s largest concentration of international scientists and physicians, but has insufficient funds to sponsor all of its vital cancer research projects. » ICRF shares its techniques with other research scientists without charge. » ICRF has funded over $52 million for over 2100 grants which have had major impact on cancer patients in the US and throughout the world. » When ICRF-funded scientists find a breakthrough, it is given back to the institution that founded the research. » Cancer is overtaking heart disease as America’s No. 1 killer. Another 35 reasons you should pay attention to ICRF: Honorary co-chairs Harold Matzner, and Barbara and Jerry Keller; event co-chairs Patrick Mundt and Dr. Jeralyn Brossfeld; board officers Charlotte Sternlieb and Gloria Guttman, along with other supporters and attendees Donna MacMillan, Annette Bloch, Georgia Fogelson, Lori Serfling, Shellie Reade, Melissa Neiderman, Peggy Cravens, Renee Glickman, Marion Schaefer, Marion Goldin, Pam Erwin, Marjorie Victor, John Clancy, Barbara and Bernie Fromm, Teri Ketover, Susan Rosser, David Brinkman; Melissa, Tristan, Reid, and Scott Milanovich; Steve Maloney, Taira Rapoport, Robin Milstein, Madeline Zuckerman, Phyllis Eisenberg, Mary Lester. 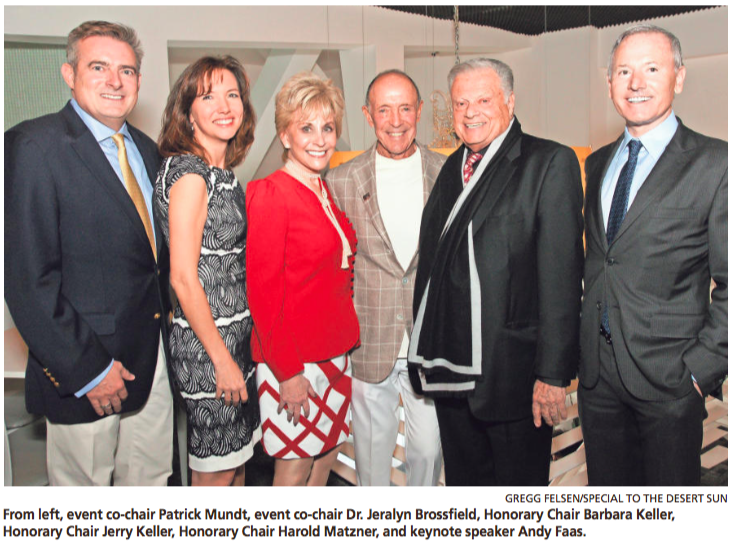 Roger Perry, Joyce Bulifant, Bobbi Holland, Bruce Landgarten, Geoff Kors and Carl and Richard Sukman. “Those are the three most heart-stopping words in the world” said luncheon speaker, Andrew Faas, a former desert resident, now living in Florida. Faas is a successful management adviser who focuses on organizational transformations and is a generous philanthropist in his own right. In 2005 he was diagnosed with leukemia and was soon prescribed Gleevec , a drug developed from ICRF’s research. He now heads the Faas Foundation which focuses on Health Care, Education and Medical Research. More importantly, he is healthy, energetic, and dynamic. One pill a day has changed his leukemia from “fatal” to merely “chronic” with no side effects! In his brief, to-the-point remarks, Faas, who spent 11 winters in the desert, praised Eisenhower Medical Center’s cancer facilities. Call (310) 274-2400 to be on ICRF’s free, no-obligation mail- ing list. Or register at www.icrfla.org.